The collaborative project of musician Brian Ritchie and architect Stuart Tanner acknowledges this Zen monk tradition of transitory wandering, whilst exploring contemporary instances of how space, sound, movement, and experience might poignantly intersect. Ritchie and Tanner share an interest in clarity and simplicity. Ritchie’s sonic pursuits are underscored by both the active directness that first propelled and continues to sustain his punk-acoustic group the Violent Femmes, and his traditional training and ongoing practice in the Shakuhachi, for which he is a licensed teacher/performer granted the name ‘Tairaku’, translating as ‘big music’. Traditional Honkyoku (Zen compositions) of Shakuhachi are expressed in three forms: Shin, Gyo and So. ‘Shin’ is the basic form learned from the teacher; ‘Gyo’ are variations retaining the basic form; and ‘So’ improvise new interpretations expressing the basic sentiments of the piece, but with a great deal of flexibility allowed to the performer. Ritchie and Tanner extend the improvising potential of ‘So’ expressive form to create compositions interplaying space and sound. Each particular temporary installation in different public environments composes a performance zone that is distinguishable from that of everyday busking. This affords Ritchie an opportunity for the live composition of new Shakuhachi performances in relationship to the material consistency of the ‘temple’ space, and in concert with the contingencies of its present environmental conditions and social circumstances. The compositions that emerge are the aesthetic gifts of ephemeral moments, lightly extending an ancient wisdom practice to encounter the ‘real now’ of a live urban condition. Portable Komuso Temple Compositions, 2015. Photography: Mick Douglas. Portable Komuso Temple Compositions, 2015. Photography: Rob Eales. Portable Komuso Temple Compositions, 2015. Photography: Zihan Loo. The international community of scholars, artists, activists, and ratbags that comprises PSi is not used to rock stars. Encountering Brian Ritchie of Violent Femmes fame at the tea break at RMIT last October was to sense a shift in the force, the way that a celebrity entering a space changes the atmosphere. Everyone else, all the non-celebrities, must acknowledge this change in some way even though we may try not to. Our behaviour is thereby oriented around the fame that person carries with them. 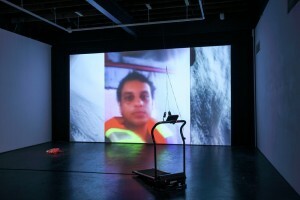 This everyday ‘media ritual’ as Nick Couldry describes the encounter with celebrity, is significant as it reaffirms the continuous efforts made by the media to constitute the centre of meaning-making activity within the social, as fame is generated by media, the encounter with it reinstitutes the centralising position of the media in our societies. This is all fine and explains the odd sensation of discomfort that often arises in this situation. Do we go up and chat to the celebrity or not? We want to be touched and acknowledged by the significant figure as it might convey upon us in turn a special status. But Brian Ritchie was not in Melbourne in his role as rock star /celebrity but to perform some humble Shakuhachi compositions. He studied these Japanese bamboo flutes for seven years in New York City, achieving the rank of Jun Shihan (teaching license) in March 2003 and the professional name ‘Tairaku’ meaning ‘Big Music’. In his Portable Komuso Temple Compositions, Ritchie was reactivating the tradition of the mendicant zen monks (komuso) of Japan who travelled between monasteries, playing the shakuhachi and seeking enlightenment. In this project, Ritchie collaborated with the architect Stuart Tanner who designed the collapsible mobile stage for the event that Ritchie dutifully wheeled around the city of Melbourne for the duration of the conference to reach the different locations for his recitals. ‘Shin’ is the basic form learned from the teacher; ‘Gyo’ are variations retaining the basic form; and ‘So’ improvise new interpretations expressing the basic sentiments of the piece, but with a great deal of flexibility allowed to the performer. The ‘So’ variations performed by Ritchie, and repeated later at RMIT, were around 45 minutes in duration and were accompanied by his matter of fact introduction to the practice and the construction of the flutes (he used a variety of instrument sizes to vary the tone, some have five holes, others only four). 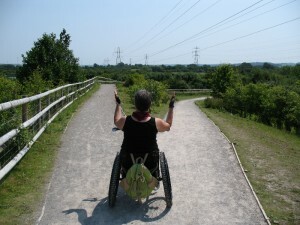 In this sense, these performances were perfectly in accord with an event like Performing Mobilities with its attempt to think through performance and movement to engage with the dynamics and contingencies of different spaces and conditions (environmental and social) for human symbolic activity. The afternoon I saw the performance in M-Pavilion was astonishing, as I did not know Ritchie would be there, nor that he was a Shakuhachi player. I found the performance mesmerising and also quite moving in its simplicity, its complete lack of spectacle, its repudiation of mediation. 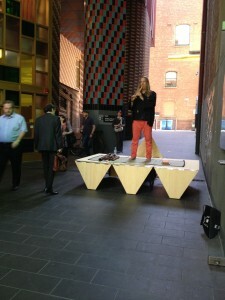 I was doubly floored by his reappearance at RMIT a few days later. Maybe next time I will read the program more closely. And I didn’t talk to him at the tea break. Celebrities need some time off too.